Pinot Noir, La Forge de Tart, Premier Cru, Morey-Saint-Denis AC, Côte-d’Or, Bourgogne, France, 2007, 13.5% abv. Sylvain Pithiot, the winemaker at this famous house, originally arrived in Burgundy as a map maker – he’s the person who created the incredibly detailed terroir maps of the Côte d’Or. It wasn’t until later that he decided to make wine. But Pithiot didn’t decide to make wine just anywhere. Since he knew the maps so well, he was able to pick very carefully. To put this in perspective, the Clos de Tart Grand Cru wines are Monopole wines that have been in production since the Middle Ages (the 1100s!) – and there are only six Grand Cru monopolies in Burgundy – four in Vosne (La Romanée, La Romanée-Conti, La Grande Rue and La Tâche) and two in Morey-Saint-Denis (Clos de Tart and Clos des Lambrays). It’s just a tiny bit possible you may have heard of a few of those places. They’re kind of, well… they’re extremely famous. This wine is the Clos du Tart’s Premier Cru version, their second label, which was registered in 2005. Being second label, however, does not mean second fiddle. There is nothing secondary about this wine. A translucent ruby on the eyes, its nose is all cherry, soft fern and raspberry. The palate is dry with medium plus acidity and strained tannins. Flavours exude cherry and red plum with a scraping of tar and dried rose petals. A softly elegant drink, this is WSET Very Good plus and at the very end of its drinking window (we opened it in November, 2016 at 9 years). If you’re holding, decant to unwind and drink now (2016). Another huge thank you to the generosity of Chef Francine and Table 1006. 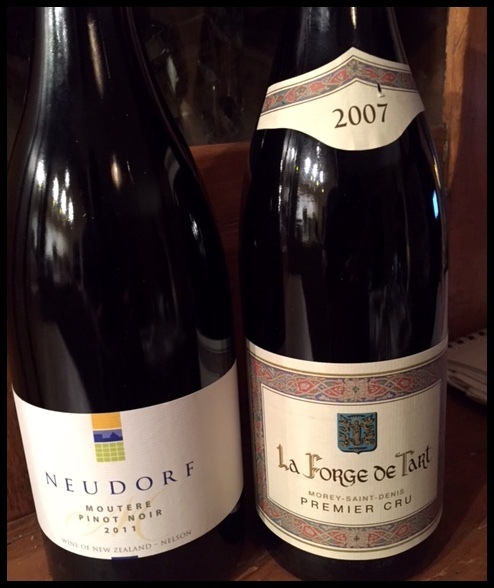 This entry was posted in France, Pinot Noir, RED and tagged 2007, Bourgogne, Côte-d'Or, france, French wine, La Forge de Tart, Morey-Saint-Denis AC, pinot noir, Premier Cru, red wine. Bookmark the permalink. 2 Responses to Pinot Noir, La Forge de Tart, Premier Cru, Morey-Saint-Denis AC, Côte-d’Or, Bourgogne, France, 2007, 13.5% abv. You are most welcome Llama, love drinking wine with you!